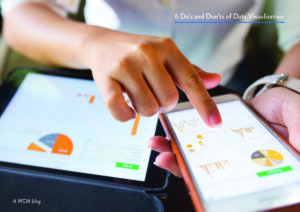 Data visuals can improve your marketing strategy by providing your audience with quick, compelling and easily consumable information. Of all content types, infographics are most likely to be shared on social media and therefore more likely to drive traffic to your website. It’s no wonder data visual tools such as Tableau have garnered over 6 times as many users over the past 7 years. But big sets of numbers and countless visual options might make the task of data visualization appear overwhelming. Here are some guiding points to keep in mind as you bring your data to life. Cognitive studies show the brain prefers to look at bar charts over pie charts, and that scatter plots are more easily processed than line charts. Before jumping into a design, do some research on what format will work the best for both you and your audience. While colors are important depict categorical differences, too many of them may be distracting. Make sure every color you choose has a distinct purpose and makes the chart easier to read. Also use distinctive colors that are easily distinguishable to ensure your reader can see each category. In today’s “digital age,” most users expect some level of interactivity when they are online or using mobile devices. Interactive content is 81% more effective at grabbing consumer’s attention than static content is. Some simple ways to add interactivity are: clickable controls to view specific data sets, links to original sources, and allowing users to customize the size of the graphic by zooming in or out. The option to share a chart or infographic over social media is crucial to expand your reach and build your brand. It is also important to consider the visual difference of a post on facebook versus a tweet, versus LinkedIn, and so on. You want your visual to be compatible with all mediums to reach the broadest audiences. Ask yourself: What is the narrative of my data? What information do I want the user to take away from it? Prior to making your visualization, look for patterns and trends, then think about how you can visualize them. For example, if you find there is an increase over time, a line chart might be the best way to tell a story of growth. When pulling data from outside of your organization, make sure it is coming from a trustworthy source. There are many ways to verify the credibility of your data, such as checking where it was published or who funded the collection. Sticking to these tips will help you make effective visuals, allowing you to transform data into something that benefits both you, your brand and your audience.